The MESSENGER spacecraft left Earth in 2004 carrying among its instruments a sensor built at Michigan Engineering's Space Physics Research Lab. Over the years, some 75 U-M researchers, including faculty members, engineers and students, were involved in either making the Fast Imaging Plasma Spectrometer, also known as FIPS, or analyzing the data it sent back. MESSENGER, which flew by Venus and Mercury before entering orbit around the closest planet to the sun, will end its mission April 30, 2015, by crashing into Mercury, as NASA intended. 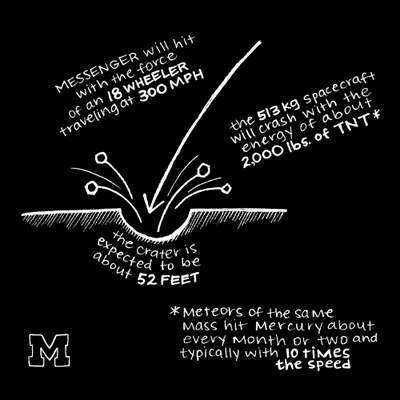 We asked Jim Raines, a U-M research scientist in the Department of Atmospheric, Oceanic and Space Sciences and MESSENGER team member, to help quantify the crash. He worked with others on the MESSENGER team to put it in perspective. Meteors with the same mass as MESSENGER (513 kg) slam into Mercury about every month or two, and typically with 10 times the speed and 100 times the energy. The planet doesn't have a thick atmosphere that would slow down objects headed for the surface. The crater the craft will leave near Mercury's north pole is predicted to be about 50 feet wide. That's the width of an NBA basketball court. The 1,131-pound spacecraft will hit with the energy of about a ton of TNT, or the force of a car traveling at about 2,000 mph. At almost 9,000 mph, the craft will be traveling three times faster than a speeding bullet and nearly twelve times the speed of sound. 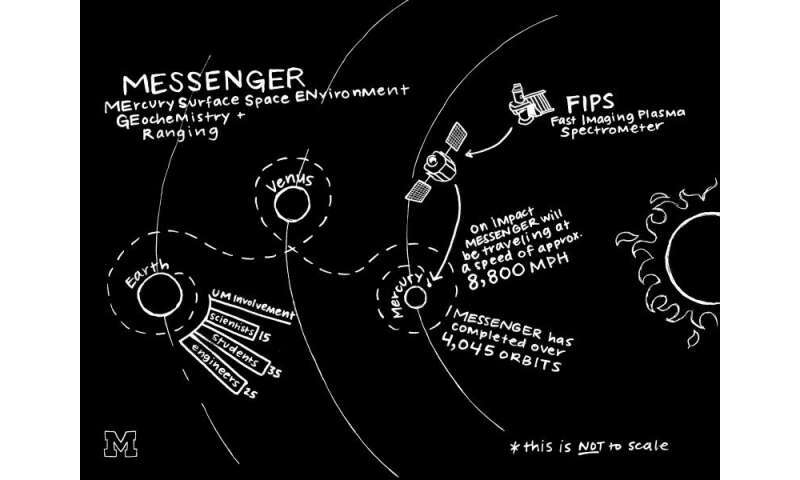 On MESSENGER's last orbit, it will pass just 900 to 1,800 feet over the planet's surface. We have buildings that tall on Earth. Nearly 55 percent of MESSENGER's weight at launch was fuel - which is about to run out. The MESSENGER (MErcury Surface, Space ENvironment, GEochemistry and Ranging) spacecraft that carries a sensor built at the University of Michigan is about to crash into the planet closest to the sun, just as NASA intended.